At Jauma, James Erskine strains grape skins and seeds from a fermenting sample with his hand. Winemakers who keep their wineries spotless and hygienic would have been horrified by the sight that greeted me at Jauma, one of the stars of the natural wine movement in Australia. Flies buzzed about a motley assortment of upturned barrels and plastic tanks—any handy vessel large enough to contain a fermentation—the tops draped with old tablecloths and bedsheets. 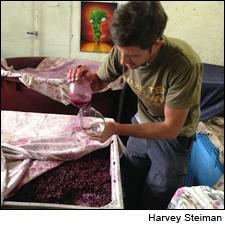 James Erskine pulled back one of the covers to reveal a mass of purple grape bunches bubbling away in their juices. With no spigots to tap, he took a sample of the Grenache for me to taste by holding a large wineglass by the top so his hand would filter out some of the solids and plunging the glass deep into the fermenter. Dripping with mauve juices, bits of grape adhering to his hands, he tipped some into my glass. The fermenting juice was sweet and delicious. At this point, of course, it's hard to tell how this ferment will end up. Will it go all funky and weird, as often happens with wines identified as natural? I tasted some bottled wines. His Jauma Audrey 2013, a Shiraz-Grenache blend, is light and spicy, with cedary flavors but plenty of bright, clear fruit, open-textured and crisp with acidity. A likable wine. A 2011 Grenache shows red fruit and white pepper on a light frame, open in texture. A Chenin Blanc looks cloudy and has a slight fizz. It reminded me of Cooper's Pale Ale, a bottle-conditioned beer that's long been the pride of South Australia. I said so. Erskine grinned. "Thank you. You got it!" Erskine, who was once named top sommelier by the influential Australian magazine Gourmet Traveller, said that sommeliers are leading the charge for natural wines here, as is the case in the U.S. "We are looking for something more expressive than more familiar wines of similar quality," he said. He pointed out that Australia doesn't require everyone to make wines according to rules laid down by a government body, as they do in Europe. "But everyone here was following the same unwritten rules, which say what an Adelaide Hills Sauvignon Blanc should look like," he said. "If you use wood on it, or if it is cloudy, the flavor profile isn't what you expect. You might not like it, but at least it expresses something different." Jauma was my first stop in a full day visiting self-identified natural winemakers in the Basket Range, a steep section of Adelaide Hills carved by wooded ravines. Defining what makes a wine “natural” is a precarious endeavor. The basic idea is to avoid adding anything to the wines at any stage of the process, including (but not limited to) yeast, acid and sugar, unless it came from the grape bunches themselves. As was true of the four vintners I saw, the details may vary. Some reject any form of mechanical refrigeration, or find cleanliness less of a virtue than others. But their wines struck me as particularly harmonious, if not always to my taste. At Lucy Margaux, where Anton von Klopper cheerfully warned me, "I have the dirtiest winery with the cleanest wines," the fly population in the open-air fermentation area easily tripled that of Jauma's. Containers were everywhere—under a lean-to, beside the gravel road. On the facing hillside, his 7.5 acres of biodynamically farmed, un-irrigated vines look scrawny, producing less than 100 cases of light, airy Pinot Noir. How can that make economic sense? "It's an experiment in passionate neglect," he shrugged. Inside, a tattooed and pierced associate used an X-acto knife to carefully trim labels freshly produced on a computer printer and applied them to a table full of bottles. Like Erskine, von Klopper takes a different tack from the usual Adelaide Hills Sauvignon Blanc. His Domaine Lucci 2013's supple mouthfeel gives a textural element to the grapefruit, quince and, oddly, honey flavors. "Better than too much green," he said. The Lucy Margaux Sauvignon Blanc 2013 is more oxidative, and less charming to me, and a 2013 Sauvignon-based blend, called Wild Man Blanc, looks like an orange wine, tastes like one, and is the first of its ilk I actually like. It has clean flavors, and yes, a hint of orange peel, and is long and expressive. "I use whole bunches and leave it outside to ferment," he said. "It showed me that wine can clean itself up if you're patient." I found funkier flavors in the Pinot Noirs, except for the minuscule production from his own vines, and a Merlot was too soft and squishy for my tastes. There is nothing funky about the wines at Ochota Barrels, where Taras Ochota applies his experience making custom-crush wines in Italy for a Swedish wine company and more recently as assistant winemaker at Two Hands in Barossa Valley. He just prefers a lighter style than is the norm in Australia. "I like that sapid nervous tension that comes from grapes picked a few days earlier than usual," he said. "To me, glycerol and alcohol from riper fruit comes through as sweetness. It can inhibit your appetite. I want my wines to make your mouth water." His previous work taught him how to keep the wines sound. "I learned enough to make educated decisions about what to risk," he said. "I learned to find the right vineyards and trust my palate." Ochota owns no vineyards but works with a small roster of growers. Among his 2013s, the stars, for me, are the Grenaches, which are from McLaren Vale. One is phenolic and fresh, with juicy flavors on an open frame. Another has ripe red fruit at the core that doesn't quit. The luxury bottling, called Ochota 186, is velvety, long and refined. A Barossa Syrah is also a revelation, fresh and vibrant rather than spicy and rich. An Adelaide Hills Chardonnay is sleek, with a mineral note, but an off-putting apple cider character. A Pinot Noir is light on its feet, with a caramel note adding interest to the fruit. At BK Wines, Brandon Keys uses a gigantic 800-liter concrete egg to give a gin-and-tonic feel to his sprightly Pinot Grigio. At slightly more than 200 gallons, four times as spacious than most of the eggs other wineries are playing around with, it allows more of an impact on his wines, including the Chardonnays. A vertical tasting from 2008 to 2013 shows wines of zip and energy, crisp but also ripe in flavor, persistence on the finish a trademark. He is also experimenting with a fizzy Chardonnay, bottled at 8 grams per liter residual sugar and allowed to finish fermentation in the bottle, producing carbon dioxide. It's what we used to call a crackling wine. "A new dish on the menu," he grinned. The reds get extralong macerations on skins after fermentations. One of them, BK Skin and Bones Pinot Noir 2013, shows it, with bitey phenolics, but it has a delicate intensity of spice and fruit. Better is the 2013 Adelaide Hills Syrah, lively, juicy with currant and blackberry, finishing with fruit, fruit and more fruit on a crisp frame. I also liked the Cult Syrah 2013, which has an open texture, more tannins, fresh blackberry and spice flavors, added density from bleeding off 15 percent of the free run (which is added to the regular bottling). Mazi Syrah 2012 is firmer yet, with generous blackberry and floral flavors and a sprinkling of pepper on the finish. It is no doubt dangerous to generalize from such a small sampling, but it strikes me that the biggest difference between the natural wine mob in Australia and their brethren in America is attitude. These Aussies want to try anything that interests them, but they don't look down on other wines. They see what they're doing as a worthy addition to the existing matrix of wines. At one point Erskine (the ex-sommelier) said, "Everyone loves Penfolds. It's in our blood." I can't imagine an American winemaker devoted to natural wines saying the same of, oh, say, Mondavi. "We just want to develop some more diversity, have fun, break some of the rules, see what happens," he said. Well done, great to see you are keeping you eyes and ears so open after 30 years reviewing the wines of Oz. There is some real talent in this group; I have enjoyed bottles for each producer you visited. Australian winemaking was very industrial and myopic in the 80's, better vineyard practices pursued in the 90's, we moved to a more caring winemaking style in the 2000 and I see us now stretching our artisanal side in the 10's......all in all there have never been so many interesting winemakers looking at the same subject be in through many different lenses and this creates many great wines and possibilities. Sense and Sensibility…………….. I just hope your market gets behind these guys, our country need them to succeed. I hate to say it but you are the closed minded one. You don't know about the attitude of most of the so called natural wine makers in America. I am friends with a lot of them and most drink all sorts of wine. Also most of them have spotless and hygenic wineries.